Aaron Koblin is a data visualization geek. He believes that “data systems tell stories about our lives”, and he’s in the business of building beautiful, poetic images that tell those stories. Some of his earliest works looked at mapping georgraphy in terms of the use of infrastructures. 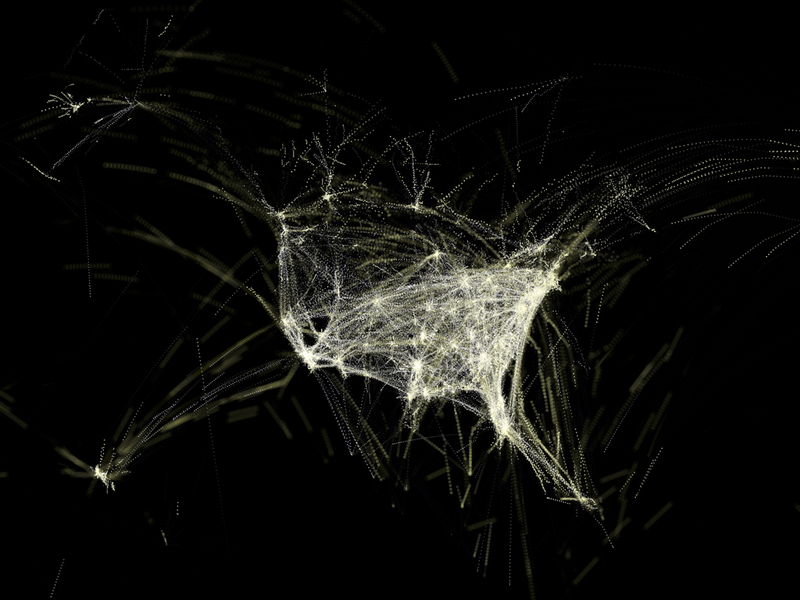 The image above is a map of North America drawn by tracing the paths of planes in flight. As this map moves through time, you can see the East Coast wake up and get on the road, followed by the midwest and into the West. “You’re able to intuit the system without knowledge of any geography.” He’s built similar maps of traffic accidents, of email flow, and a visualization of data coming into and out of New York City called the New York Talk Exchange. Recently, Koblin is fascinated by Mechanical Turk – both the historical wooden figure that allegedly played chess (it didn’t – a man sat inside the machine and made the moves) – and the contemporary data outsourcing service offered by Amazon. Most of the tasks people are asked to do with Mechanical Turk are extremely boring and repetitive – Koblin offered a much more human task: Draw a sheep, facing left. If you did this, using his online tools, he’d pay you $0.02. Over forty days, more than 7000 people drew 10,000 sheep. They took 105 seconds, on average, to complete the task, which makes this not an especially good way to make money, but a lovely way to make art. Why sheep? They were, perhaps, the first industrialized animal, an animal we used to produce industrial materials.Sheep symbolize following. They were the first animal humans learned to clone. And it’s a reference to Le Petit Prince, where the character asks the narrator “draw me a sheep”. But the real purpose of Mechanical Turk is making money. So he launched a project called Ten Thousand Cents. It invited Turkers to draw a very small part – a ten-thousandth – of a hundred dollar bill. Everyone who participated got a cent… and producing a hundred dollar bill cost one hundred dollars… and the sales of prints supported One Laptop per Child, the former Hundred Dollar Laptop project. It’s interesting to see how many people rebelled, drawing something other than the section they were assigned. When you put ten thousand small images together, that rebellion basically disappears and becomes invisible. More recent works have included a music video for Radiohead and a visualization of Amsterdam in terms of SMS messages sent. Whether it’s visualizing Thom Yorke or the human structure of a city, Koblin brings an artist’s eye to a data-rich world. I saw a talk by Aaron at Thinking Digital in Gateshead earlier this year. It was absolutely awe inspiring – a real highlight of the event.